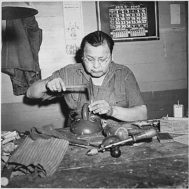 Soul of Nations assists young artists from Southwestern reservations to foster their creative abilities, gain gallery and museum exposure, and develop business and marketing skills. 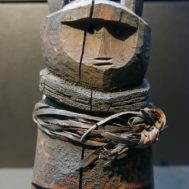 A 2017 renewal grant from the ATADA Foundation, a non-profit organization supported by tribal art dealers and collectors, will be used to continue and expand Soul of Nations’ work. While visiting Santa Fe’s annual Indian Market, Soul of Nation’s founder Ernest Hill described how the nonprofit grew out of a personal commitment, and had expanded as he and his co-workers partnered with tribes to assist young people on the reservations. 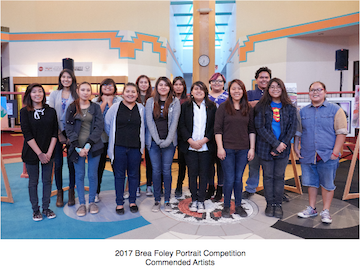 Earlier this year, Hill traveled with young Navajo artists to the National Museum of the American Indian in New York as part of the group’s 2017 Brea Foley Portrait Competition. The competition is for Native youth ages 15-18, who submit artwork to a juried show at the Navajo Nation Art Museum. Through the Soul of Nations program, this year’s three winners were able to travel to New York to show their work, see the NMAI, and visit galleries and museums. The group partners with the Navajo Nation Museum, and has ties to the National Museum of the American Indian in New York. The NMAI program director works closely with the advisory board for Soul of Nations art programming, and the museum’s awareness of the groups work has resulted in many opportunities for young Native American artists to expand their horizons. 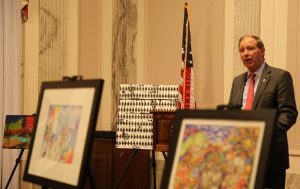 Senator Tom Udall of New Mexico at the National Museum of American Indian Soul of Nations presentation. Many schools on the reservations do not have arts programs, yet for young Native Americans, art is a crucial means of expressing and exploring tribal identity and tribal culture. Hill says that Soul of Nations has connected with about 1500 young people through events and arts programming involving eleven different tribal communities, including Hopi, Zuni, Apache, Navajo and more. 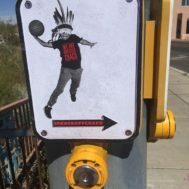 Hill said that young people will include symbolism and images that are particular to their culture in their art, but the youth tend to view this as a form of Native empowerment and strengthening their culture. The younger generation is well aware of past exploitation, but Hill’s experience is that the youth is more willing to engage in open dialog. “They are very willing to share and explain their work,” Hill said, “when others are interested in learning and come with a good heart and without mal-intent.” The meetings that young people have had with the NMAI staff and supporters was a great opportunity to expand this communication. “There should be more opportunities for that open dialog,” he said. In a final word, Hill expressed gratitude for ATADA’s continued support and involvement for both 2016 and 2017. He hoped ATADA will continue to support Soul of Nations and the positive work it does in the Native community, since there is so much yet to do: “Our group is there to uplift, never to tear down.” The Soul of Nations team is based in Washington DC with a field office in Flagstaff, AZ; some of the team are tribal members, some not. Contact Soul of Nations, info@soulofnations.org, (202) 643-2164.